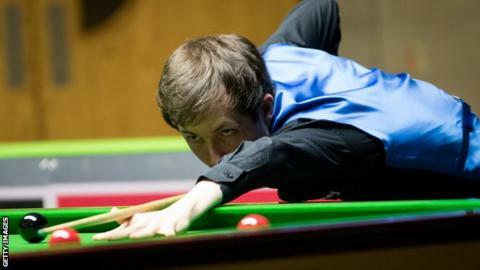 Scott Donaldson has vowed never to set foot in the Crucible Theatre until he achieves his dream of qualifying for the World Snooker Championship. The Scot, 25, has failed to reach the global showpiece, held at the iconic Sheffield Venue, in six attempts. But Donaldson is "pretty positive" about his World Championship aspirations. "I've never been to the Crucible. I will never be there until I qualify," he told BBC Scotland. "I am pretty positive I will qualify at some point, my game is in pretty good shape. Whether it is this year, or some year in the future, I would love to play there. That is why you pick up a cue. "A player's career can be determined by his World Championship performances - that's how big it is." This month, 128 players will compete for 16 places at the tournament, with those qualifiers joining the world's top-ranked 16 players at the Crucible. "Everyone outside the top 16 has to play three best-of-19-frame matches. It is a lot harder than people think it is," Donaldson added. Donaldson hopes to draw inspiration from Ronnie O'Sullivan's renaissance, as the 43-year-old returns to the top of the world rankings for the first time in nine years despite playing only around half of the competitions on the tour calendar. The Scot faced "the Rocket" five years ago and was beaten 4-0. "I can play at that standard, but he just does it consistently," Donaldson added. "It definitely gives you a good bit of hope when he is doing that at 43. He seems to be getting better with age. He can cause controversy, but the game needs him."